Hell Week. The final week of preparation before seeding begins. A week of increasingly furious and, well, frantic work in a frenetic push to try and be ready to go seeding when the time is right. This is a week marred by stress and anxiety; but beneath it all, excitement starts to build. Every year is a little bit different. Last year at this time (and the year before that), winter still had us firmly in its grasp, and any thoughts of seeding were still weeks away. The last two winters were long, cold and dismal, with spring coming disturbingly late. This year is quite different; the snow has been basically gone for a month now, and we have been blessed with warm, dry weather for some time. Fields are enticingly dry, and seeding is actually a tempting proposition– and could really begin at any time. Getting ready for seeding is a hard thing to explain. Every piece of equipment on the farm (save the combines) must be woken from its winter slumber, pulled from whatever shed we could find to try and keep it inside. Everything has to be started, drug out onto wet, sloppy spring soil, and gone over with a fine-tooth comb to check for any potential problems that could arise. 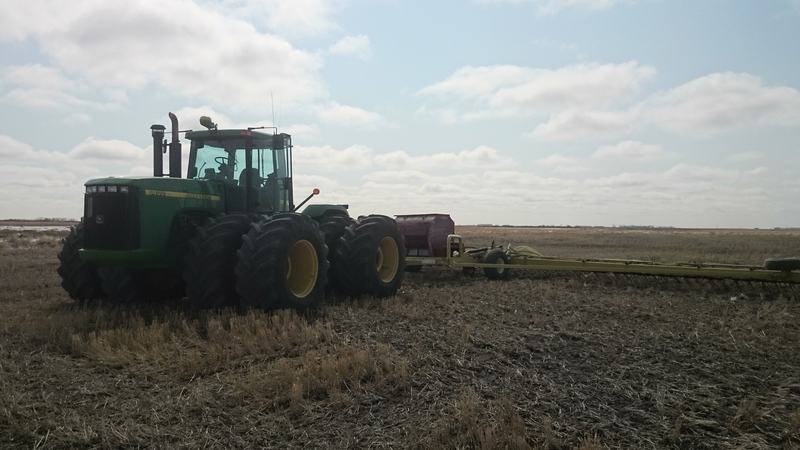 Every shank, hose, pipe, tank and clamp must be checked on our air drills before seeding begins; no downtime is acceptable for these components once seeding gets underway. Meanwhile, liquid fertilizer tanks, full of hundreds of tonnes of fertilizer delivered during the winter, must be circulated to prevent settling, and final fertilizer plans must be completed to ensure enough product is booked. 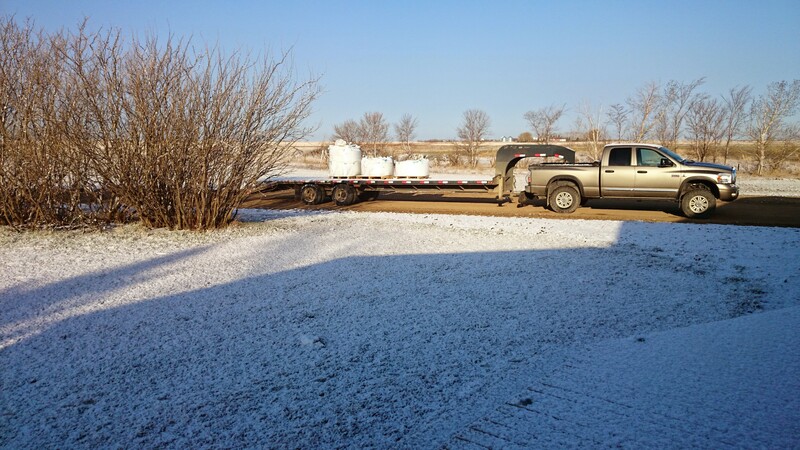 Grain hauling continues as it has all winter, and in between, seed must find its way home. Crop protection products of all kinds, from seed treatments to glyphosate, needs to be brought to the farm, with hundreds of thousands of dollars of jugs, barrels and totes accumulating for the busy season. This year, we took on a few improvement projects, such as replacing the hose on our Valmar/heavy harrows, since the original hose was quite possibly older than I am. Of course, since these machines are much less common now than they were decades ago (they are mostly used for spreading and incorporating dry herbicides), nobody keeps this hose in stock. So, we ordered what we thought would be enough. Three days later, we got it (just before the weekend of course) and installed it last Saturday. Can you see where this is going? We didn’t order enough! And now we had to go and order more; which wouldn’t be here until the middle of the week! We planned on spreading herbicide on Monday, so this would substantially delay our plans. Simple mistake, complicated consequences. Fortunately, we found a store that sells the hose, and the Valmar got in the field Tuesday. Our first field operation of 2015! Of course, the day ended with a broken harrow mount and the drive wheel for the Valmar falling off, because we wouldn’t want things too easy. Anyway, it’s going again, and that job should be completed today. Between all that, we continue to work on the drills, get other field operations rolling, such as our Salford, and prepare the sprayer for its turn getting out of the gate. One thing about spring is that everything is happening at once. We still have grain to sell, and we will forward contract grain for harvest delivery at this time of the year as well. Budgets are still coming together as our numbers become more real, and ensuring we have enough cash flow to get through the summer is a constant battle. These are very real and very important aspects of the farm that cannot be postponed for seeding. In years like this one, when spring comes early, sometimes the temptation to go out and seed too early is very strong. Given the past few years of wet weather, any opportunity to start early is hard to pass up– and shouldn’t be, to a certain degree. Planting too early in our part of the world is high risk; late spring frosts are a real possibility, and can devastate crops like canola, with their exposed growing point. In fact, in late April, we can really see any type of weather: hot, summer-like days or bitter cold, thunderstorms or blizzards, but above all else, indeed on most April days, a howling wind seems to be an ever-present annoyance. One day you look at the forecast and think you should start seeding tomorrow; the next day, you think it needs to wait another week. The timing is very difficult to determine. Didn’t expect to wake up to this Tuesday morning – but then, that’s April for you. As the days of Hell Week wear on, field operations slowly commence, with little jobs like picking rocks and draining sloughs coming first, transitioning to tillage and herbicide application, and finally seeding begins. As these days go by, jobs slowly get knocked off the list and planting looks a little closer. We are close now. 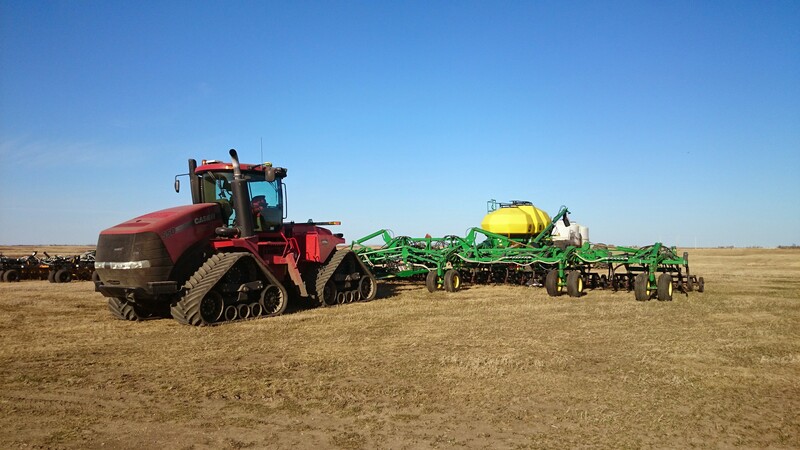 The drills are almost ready, the sprayer is ready, and almost all the support equipment is ready to roll. Seed is treated and loaded in our trucks, and our fertilizer is ready to pump. Seeding is almost here. For farmers, the anxiety of getting those first seeds in the ground grows every day that Hell Week drags on– but, beneath it all, that anxiety is really excitement; the joy of leaving winter behind, the anticipation of the crop that this year could bring, and the delight of getting all that equipment moving again. Hell Week may not be much fun; but the aftermath is unforgettable.